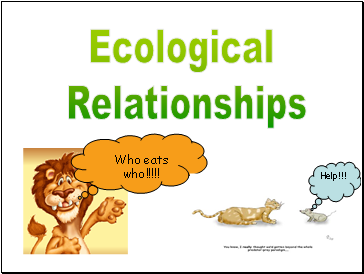 Ecological Relationships are of two types - Oppositional Relationships and Symbiotic Relationships. Symbiotic Relationships are of four types - Mutualism, Commensalism, Amensalism & Parasitism. Predation - In this category generally the predator feeds on the prey species by killing it. The former can deploy several tricks to kill the later whereas the later also deploys many tactics to avoid capture. Examples - Carnivorous Predation where one animal kills and eats other like wolves hunting moose, owls hunting mice, or shrews hunting worms and insects. Group Predation where many small carnivores hunting a large animal. For eg. many lions in group killing an elephant and then eating it. Competition - This involves the competition among different organism/animals for limited available resources. This competition turns out to be good for one animal and bad for other. This competition can be interspecies and intraspecies also. 2. Dolphins go along together and play with each other, but when it is time to eat; all dolphins have to compete for a meal. 1. A lizard and a frog compete to eat a small insect. Mutualism - It is a type of relationship in which both the parties benefit from each other. 1. A flowering plant producing nectar to attract an animal, such as a bee. The bee benefits by feeding on the nectar, while the plant benefits because the bee goes on to disperse the plant's pollen. 2. Relationship between Bovines and bacteria within their intestines. The Bovine benefit from the cellulase produced by the bacteria, which facilitates digestion. the bacteria benefit from having a stable supply of nutrients in the host environment. Commensalism - It is a type of relationship in which one party is benefited while there is no significant affect on the other party. the cattle egret follows cattle, water buffalo, and other large herbivores as they graze. The herbivores flush insects from the vegetation as they move, and the egrets catch and eat the insects. In this relationship the egret benefits greatly, but there is no apparent effect on the herbivore. Parasitism - In this type of relationship one party is benefited at the expense of other. One party benefits by harming the other. In this type, the species benefiting generally doesn't kills the other species which happens in the case of predation because the species benefitting in parasitim is very small in comparison to its host species. Amensalism - It is a type of relationship in which one species is harmed with no commensurate benefit to other species. Example of Amensalism- Animal while grazing crush the grass beneath.